Heavy equipment, heavy truck, oil field, marine, wind energy, industrial bearings, agriculture, railroad, heating ventilation air conditioning (HVAC), and heat exchangers to name a few. Can you bridge my inventory? We have capable and ready contract manufacturing to support creating bridge inventory if necessary. However, because of the nature of typical line-transfer projects, it is best if extra inventory can be created by the customer before the migration. For all the reasons that make Strategic Cell Migration™ the superior choice to traditional contract manufacturing, the best quality and reliability are delivered when we utilize your equipment and know-how. Line transfers usually take less than a month to complete, from start to finish, and can take as little as two weeks. Should your demand increase or the transferred machines become inoperable, Flinchbaugh's contract manufacturing capabilities are available to support your customer's requirements. Our manufacturing is organized into 38 channels and 125 CNC machines, set up for single piece workflow. We employ 100 CNC machine tools including a variety of machining centers and lathes. Our largest machines are Giddings and Lewis horizontal boring mills. What volumes do you process? We are not a job shop in the purest sense of the word in that we don't pursue "one-off" business. We are looking for steady repeat business that can employ cellular manufacturing techniques on an ongoing basis. For some parts, that is thousands of pieces per month, for other heavy complex parts it may be only a few dozens to several hundred pieces. There are 5 buildings on our manufacturing campus and each building is between 35,000 and 45,000 square feet. Our plants run 24/7, but not all channels or machines run at any given time. On average 1-2 shifts of available capacity exists across the board. Why should I consider a line transfer? Line transfer is a safer alternative to outsource, eliminating much of the risk associated with typical contract manufacturing either onshore or offshore. This business model is particularly well suited for complex and mission critical parts, and has the potential to deliver significant cost savings, while leveraging fully existing assets and shop knowledge. My equipment is old, why should I consider transferring it to you and expect you can produce good products competitively? Machine tool rebuilding and TPM are core competencies at Flinchbaugh Engineering. Your equipment will be restored to deliver quality, productivity, and repeatability. Additionally, by capturing your tooling, fixtures, shop knowledge, and programs, we can produce your product by the time-proven method you developed in your own shop. But it doesn’t stop there; we will use this as a launchpad for continuous improvement, applying the disciplines of Lean Manufacturing. From 1 week to 1 month. At Caterpillar in Dyersburg, TN, we moved a dozen machines and had them installed and under power in our Pennsylvania facility in less than 2 weeks. Typically, we need 1 week to remove the equipment and ship it, and a week to set it up at our facilities. Flinchbaugh will have maintenance engineers on site to supervise the disconnect and loading and to make sure that the move is efficiently orchestrated and completed. Who manages the move (including responsibility for the equipment)? Flinchbaugh Engineering (FEI) supervises the disconnection and loading and manages the installation after machines are received at the Flinchbaugh facilities. Proper preparation is key to completing the move quickly and effectively. Through the learning accumulated from 21 line transfers, Flinchbaugh has written a book with detailed checklists by functional area to ensure that nothing is missed in the transfer process. How many line transfers have you done? 21 total, with the first in 1985. Is this a turnkey operation? What resources do we need to commit? To ensure the best results and affect a smooth transition, we will need cooperation and support from people knowledgeable about the intricacies of the current production process. Your operators and engineers will train their Flinchbaugh counterparts on the current process. Shared ownership for the successful execution of the project and a willingness to work with us during start-up will assure a speedy transition. In the past, we have actually hired recommended production employees. How do you assess the capability of machinery? As part of a comprehensive financial and technical feasibility assessment, our onsite team of maintenance engineers will inspect the machinery and talk to your production and maintenance personnel. As we acquaint ourselves with a prospective customer, Flinchbaugh anticipates and then acts to proactively minimize the risks driven by the unique nature of the cell's critical parts and production process. The scope of investigation into what makes a strategic cell work, and how it can work better, is unparalleled - no other company provides a service on par with Strategic Cell Migration™. How will you get skilled labor to run the machines (particularly the specialized machines)? York County, PA has a rich history of manufacturing and a strong local labor pool of skilled machine operators. We have, in certain instances, hired customers' employees. Additionally, Flinchbaugh has the largest apprentice-training program in South Central Pennsylvania. 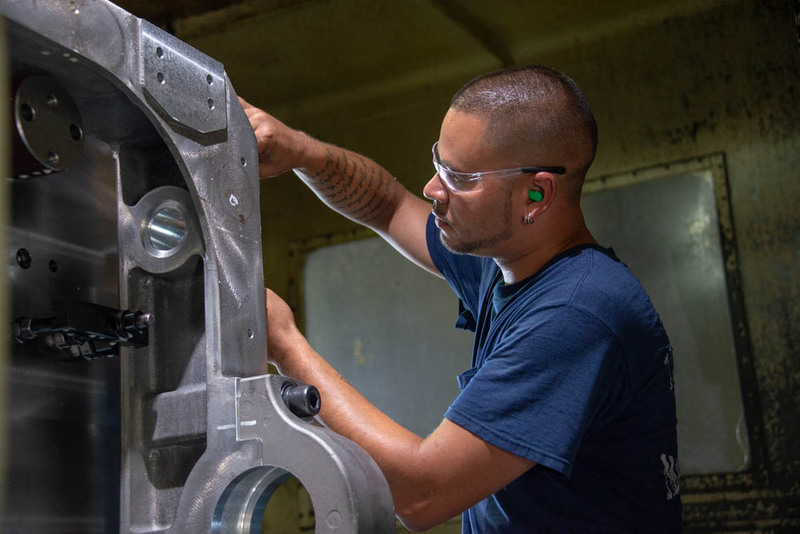 As part of the knowledge-transfer process, we will work with your production and engineering teams to ensure that our operators are fully trained to successfully and efficiently produce quality parts. This process can be accomplished on your factory floor or in York, PA.
Can you conform to my specific logistics demands/systems? We conform to a number of specific systems and requirements for major customers like Caterpillar, Siemens, and SKF. Our goal is to be a seamless extension of your in-house operations. Are you willing to buy our machines? In certain instances, we will consider this, but only if the machinery has a broad applicability. What type of support organizations do you have? We have extremely capable, high-urgency maintenance, production control, engineering, and purchasing teams to support the customer. We have sufficient critical mass and have been selective in our talent acquisition, hiring bright energetic individuals, typically with Fortune 500 experience. Typically, Flinchbaugh assumes ownership of the equipment, which more often than not is fully depreciated in our customers' books. However, in special circumstances, we have transferred the ownership in phases when it makes good financial sense - such as to avoid asset-impairment costs. How do we know you can meet our supply-chain demands? We understand that your parts need to be at your location precisely when you need them to meet your customers' demands. Our employee-ownership culture is characterized by a high sense of urgency and a solid commitment to customer satisfaction and delivery performance. That culture, combined with pervasive ownership of the principles of Lean Manufacturing and continuous improvement, results in a production team that is always trying to increase speed, quality, and productivity. To that end, we employ a modern ERP system that drives our on-time delivery performance to levels consistent with MRP-II, class A.